In a culture built on consumption--especially of food--it is easy to forget the poor that Jesus cared so much about. We get caught up in acquiring, buying, eating. Yet paradoxically, the more stuff we consume, the more our spirits wither and starve. A Place at the Table invites you on a journey of self-examination, discipline, and renewed focus on Jesus that will change your life forever. 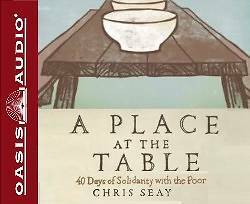 Author Chris Seay is giving you a challenge: eat and drink like the poor for 40 days and donate the money you save on groceries to a charity or project that serves the poor in concrete ways. But Chris doesn't expect you to go it alone. A Place at the Table includes a short chapter for each of those 40 days with Scripture, reflections, prayers, and encouragement. You'll even get tips for engaging your whole family in the process. This audio book and 40-day journey can be enhanced with the companion DVD. Six sessions shot in locations like the Holy Land, Haiti, and Ecuador will help small groups and entire churches go on a passionate journey of radical faith, personal action, solidarity with the poor, and extravagant grace. To download free resources and connect with others on the journey, visit www.chrisseay.net.